As the major provisions of the Affordable Care Act start kicking in this week with the rollout of new insurance exchanges where consumers can shop for coverage, a Kaiser Health Tracking Poll conducted in mid-September finds that nearly two-thirds of the public – and almost three-quarters of the uninsured – say they don’t know the exchanges open on Oct. 1. The survey finds that Americans have not found the news media to be a big help in getting information about its provisions. 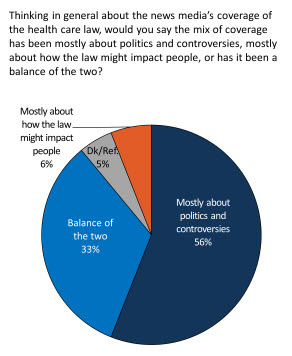 A majority (56%) say the news media’s coverage has been “mostly about politics and controversy” while only 6% say it has been mostly about how the law will affect people. A third say the coverage has been a balance of the two. More than half (53%) of those surveyed say there is not a news media source that they trust for information about the health law; 44% said there were news outlets they trusted. Of those who said they trust one or multiple news sources, 19% cited cable TV, with 10% naming Fox News and 5% naming CNN. Broadcast TV outlets and newspapers ranked second at 7% each. In the 30 days prior to the time the survey was conducted, 43% said they saw ads or commercials having to do with the health care law. Of those, 31% saw ads opposed to the law, 24% saw ads in support of it and 17% saw ads that provided information about how to get coverage.